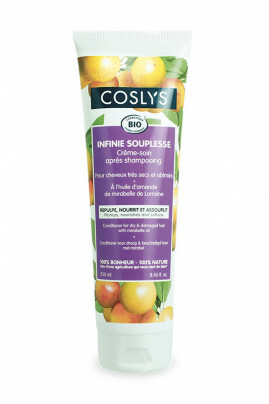 COSLYS Organic Cherry Plum Conditioner softens, nourishes and detangles dry and damaged hair. Its natural formula rich in French Cherry Plum Stone Oil and Organic Shea Butter protects and repairs breaking brittle hair, it soothes and revitalizes dry scalp. In combo with Repairing Shampoo, Coslys Silicon-Free Conditioner leaves your hair smooth, shiny and easy to style with a 100% natural sunny fragrance ! Coslys organic conditioner for good-looking hair ! After washing your hair with Coslys Repairing Shampoo, apply Organic Repairing Conditioner on wet hair. Let it pause for 2 min then rinse abundantly with clear water. Your hair will love this silicon-free 99% natural conditioner !